1870's with all the elegant ruffled trains has always been one of my favorite fashion eras, or at least ever since I saw Martin Scorsese's "The Age of Innocence" at a tender age. When I began making historical costumes I began with another of my all time favorites, 18th century, and then friends introduced me to SCA so I added late medieval to my sewing list. I was quite busy with these two eras for several years, and I still have a lot of ideas for both, but at some point I began to hark to the siren call of late Victorian again, and my pinterest boards began to get filled with late 1870s fashion plates. Then last year I suddenly couldn't resist buying tickets for the Prior Attire Victorian Ball, which meant that I would really have to start sewing and not just planning. The first thing to do was of course the corset. I had chosen a late 1870s style for my evening dress. As I was not sure about which year I might eventually end up in with my sewing ventures I decided not to be too strict about dates and just make a sort of generic late 19th century corset. The main thing would be a correct enough silhouette. The ideal Natural Form fashion of late 1870s is tall and somewhat curvy but the waistline is not yet as tiny with the huge difference between bust size and waist size that you see in 1880s fashion plates. I thought that this could be achieved to some extent without making the corset super tight and uncomfortable. On one of those internet search quests I stumbled upon this H.S. 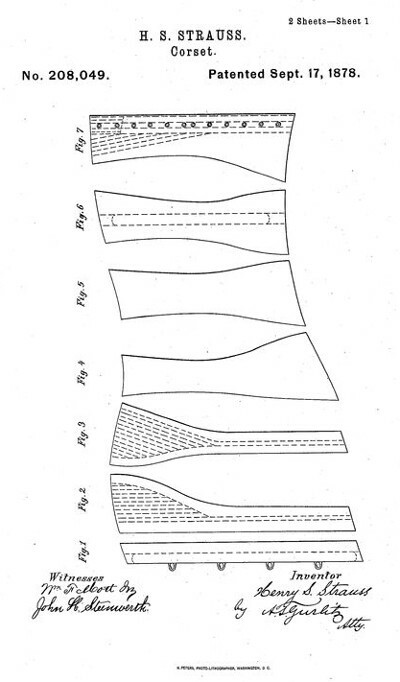 Strauss corset pattern. It was patented the same year as the fashion plate that served as my main inspiration for the ballgown, and moreover it looked rather simple and easy to adjust to my measurements. I already had a pattern for a tightly fitting boned dress bodice that I had used for this dress, so consulting that I began to draft a pattern that would match the Strauss pattern pieces but fit my body. As could easily be predicted, I had to take in quite much at the bust area, but still managed to come up with a mock up which looked something like a corset surprisingly easily. Compared to 18th century stays a Victorian corset is actually a lot easier to draft as it follows the natural curves of the body instead of molding the body into a cone shape. The first mock up needed some adjustment of course, mainly getting it tighter. I was seriously tempted to try and go for a more pronounced hourglass shape, but the decided to be a realist. It would be so much easier not to panic before every event whether I would fit in my dress or not (because no matter what I eat or don't eat I seem to get bloated so easily nowadays), so left the waist reduction on a very comfy level. I could always make a tighter corset later if I felt the need, but for now it was safer to start with something I could easily wear for a longer time. The Strauss pattern has a straight busk, but as the spoon busk appeared very soon after the date I decided I could use one. It does give nice support for the abdomen, and, well, just looks so victorian. My spoon busk is not very much shaped in profile, so I don't think you can tell the difference in dress silhouette. For the boning I used 7mm wide spiral steel, except for the sides of back lacing which have flat steel. Spiral steel is a period material, though it was mainly used for more flexible riding and sports corsets. I wanted to use it, however, as it bends nicely to a curvy shape and does give enough support for my figure if you just use enough of it. 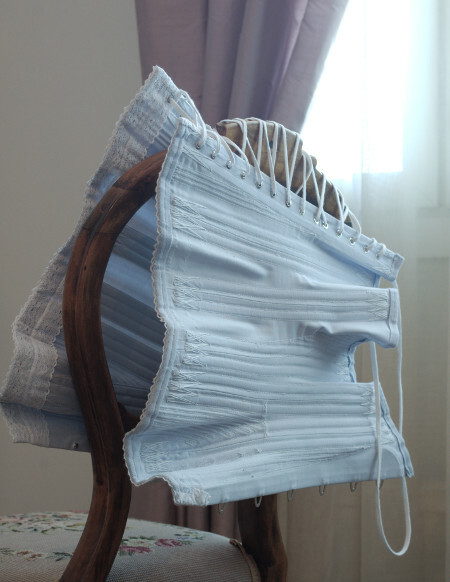 The corset fabric is Belle Modeste's plain coutil. Had I been true to the period I would have either left it white or dyed it off-white or drab, but that would have been so boring. The brilliantly colored silk corsets are more of an 1880s and 1890s fad, so I aimed for something more neutral, and decided on dying the coutil pale blue. For figuring out the corset construction and details I looked through a lot of pictures of museum pieces, but the thing I found most helpful was Before the Automobile's post on her pink corset of the same era. From that I learned about the one fabric layer technique, which seemed brilliant and might even give room for tiny fitting adjustments if needed. After I had figured out how it works I begun spotting this construction method in museum pieces too. While the basic construction is light, the seams are supported by three bones each in a casing stitched over the seam. If I read the Strauss pattern right it seems to me it has similar construction. Anyway, my slight figure does not need extreme support so I thought this light construction would be ideal. Besides, at the waist the the ground fabric is almost covered by boning channels, and the bust area, center back pieces and a piece on the hip with a larger gap in boning are supported by a double layer with cording. After drafting and fitting the pattern the actual sewing was super fun and even relaxing in a way. Compared to 18th century stays it went so fast when you could sew everything by machine and just hammer metal grommets on. I had also dabbled a bit with modern corsets before so it wasn't such a big leap as with stays. I also made the conscious decision not to strive for perfection but rather make a serviceable corset to test the pattern and get started on the new period. The cording channels, for example, are not quite even or symmetrical, but it hardly shows. The construction technique of one coutil layer with seam allowances left on the right side and then covered with boning casings is rather brilliant. I cut the boning casings with wide seam allowances which I slipped under the ground layer seam allowances, which made it super easy the keep the casings in place for stitching. The underside of the corset looks neat enough too. I could, of course, have added a floating lining but didn't feel the need to. The less fabric layers the cooler it will be on the wear. I'm especially happy about the bust area fit. The curved bust shaping seam sometimes tends to give a too sharp bullet bra-kind of look instead of a smooth curve (I guess this is why they often used gussets for bust shaping), but now I was able to smooth it into a slightly tight bone casing band which gave a very beautiful, softly rounded look. The corded pieces also help to give a nice shape and support. I put the corset together rather quickly and, unfortunately, didn't pause to take any pictures of the process. 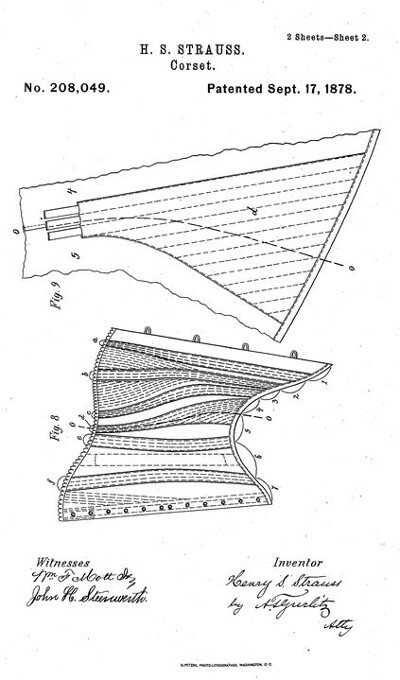 But then again, the internet is brimming with wonderful corset blogs, so anyone with further interest on the technical side will find information and instruction far beyond what I, as a fairly new to corset making could offer. I had aimed for a functional corset, but of course I could not leave it completely plain. I added a double width of cotton lace on the top edge and finished the boning channels with simple flossing. These modest decorations made the corset rather pretty. Maybe sometime in the future when I have more time, energy and ambition I will make the fancy elaborately flossed satin corset, but for now I'm really happy with this one. The main thing of a corset is of course the fit and silhouette. In regards to those my first attempt at a victorian corset was even surprisingly successful. The side profile might be a bit more curved, but as my spoon busk was not very much shaped in profile that didn't happen, partly because I also decided to leave the waist reduction on a comfortable level. The waistline is more pronounced when looked at from straight front of back, however. The corset also fits smoothly at the lower edge, which is important with hip-hugging Natural Form dresses. The corset is also very comfortable to wear, even so that it makes my 18th century stays feel rather uncomfortable in comparison. I guess the victorian shape is just more natural to my body. I wore it for the first time to a ball, and can happily report that I could easily dance waltzes and gallops almost all evening! The lovely embroidered combinations on the photographs are not my handiwork, they are an antique piece. They probably date from a bit later time than the corset but look pretty anyhow.